I'll be arriving at Heathrow in June 2015 with my current girlfriend for a holiday in the UK. I've been trying to find out which immigration queue to join at Heathrow Passport Control without much luck. I have a British passport, my girlfriend has a non-EU passport. Should I join the EU queue and she the non-EU queue or should we both queue together (and if so, which of the queues should we join)? This question arises all the time because they have never published a clear policy. They will, however, tell you their policy in a letter if you write to them. You should join the EU queue if you are married. Their policy is not to separate families during immigration control, and they will take all reasonable steps to avoid separating families. But since your question involves a girl friend, this policy does not apply. So if your girlfriend joins the EU queue, she would expect a sharp rebuke and instructed to join the non-EU queue. This is especially true if there are lots of people arriving and they are busy. Note: There have been occasions where an EU/non-EU couple used the non-EU queue and were simply waved through by the IO. This makes the non-EU person an illegal entrant. Don't let it happen. In the past, under the last government, some of these checks were lifted at times of pressure on the border. In the summer of 2008 Warnings Index checks were suspended on EEA nationals - children and adults - on Eurostar services. At Calais, Warnings Index checks were suspended on European Economic Area and UK car passengers - again, adults as well as children were not run against the Index. Since 2008, at various ports and airports, this happened on more than 100 occasions. Officials have told me that once, in 2004, local managers at Heathrow Terminal Three decided to open controls and no checks were made. See also What happens when someone inadvertently enters the UK without a landing interview? So you and your girlfriend should both join the non-EU queue if you want to transit controls together. Of course you can separate, but this strategy leaves your girlfriend vulnerable to a challenge about your whereabouts. Finally, if all the queues are empty and the IO has his 'leave to enter' stamp and he's in a good mood, she MIGHT get an interview and stamp via the EU queue, but it's not a reliable strategy, especially following the scandals. UK immigration queues are segregated by type of passport, not the visa that the person carries. 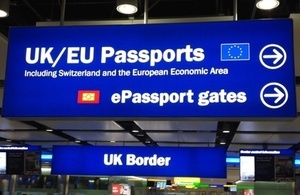 EU/UK nationals can use either queue, but non-EU nationals who are not travelling as documented family members need to use the queues as explained above. Stay together and join the Non-EU queue. However, as mentioned above, sometimes special circumstances apply. For example, my partner and I are British/Australian and my partner has a British residency card. We usually just grab an immigration customer service officer (one of the ones walking round and checking everything is proceeding correctly) and show our passports and the residency card and ask if we can join the EU queue. Usually they say yes. Make sure that your girlfriend (as a Non-EU person) completes an arrivals card, and that the Non-EU passport is appropriately stamped (or else you will have exit EU issues!). You may be able to get your girlfriend an EEA family permit as your "unmarried partner," if you can show that you and she are "in a lasting relationship." See https://www.gov.uk/family-permit/eligibility for more information. Because you are a UK citizen, you must also show that you are "exercising your treaty rights" by living (or by having lived) in another EU/EEA country. If you cannot show that, then you must enter under UK law rather than EU law. See https://www.gov.uk/family-permit/surinder-singh for more information. The EEA family permit is free of charge. If you get one, you and your girlfriend will both be traveling under the EU right of free movement, and you would therefore both be eligible to use the EU line at the border. In theory, if your girlfriend qualifies as your unmarried partner, and she is from a country whose citizens normally do not need visas to enter the UK, you don't actually need the EEA family permit. But then, to use the EU line together, you ought to have evidence of your unmarried partnership to show the border officer if you are challenged. Getting the permit beforehand would remove this requirement, and, since it is free, the investment is only one of time. Also, in the past, before I knew any of this, I took my then-girlfriend, who was traveling on a then-non-EU passport, to the EU line in a London airport. I said to the officer, I wasn't sure if we should both come to this line together, and he said, well, no, you're not supposed to, and then he processed us without further ado. That was perhaps 8 or 10 years ago. Not the answer you're looking for? Browse other questions tagged uk customs-and-immigration or ask your own question. Can non-EU wife (Leave to Remain Visa) queue with British citizen at LHR? What happens when someone inadvertently enters the UK without a landing interview? Are EEA nationals allowed to use the non-EEA queue at UK airports? Should we disclose a romantic relationship at a UK landing interview for non-EU citizens? Queue time for visa exemption when entering at Shanghai Pudong?